The Red-Belly Parrot inhabit the savannah's of Eastern Africa. 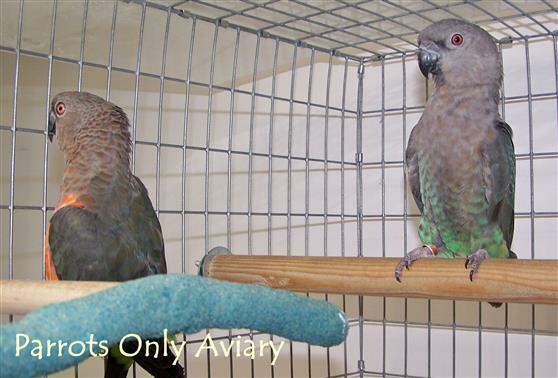 Female Red Bellied Parrots are grey with a deep forest green belly, males are grey on the back with a brilliant red belly, and tinges of red on the neck and forehead. Mature birds are about 22cm (8.6 in). Weight 113-142g (4-5 oz) . These birds are extremely social and will often show off with new words, whistles, and phrases they have added to their vocabulary. If the Red-Bellied Parrot gets out of the cage regularly, it will be more apt to try relationships with more people and other animals. Red-Bellied Parrots are very interested in any activity they can do with their humans. interested in any moving object inside or outside.